Listed below is the Emergency Information and Immunization Record Card. This is required to enroll your child in our day care Gilbert AZ and Queen Creek locations. You can click on the link below and fill out the form online and either print it to bring with you at the time of registration or email the completed form to office@achildsplaceattheranches.com. Click here to download the Emergency Information and Immunization Record Card. Listed below is our infant feeding schedule. This needs to be completed when enrolling a child 6 weeks – 12 months old. For your convenience, you may print the form and fill it out at home. 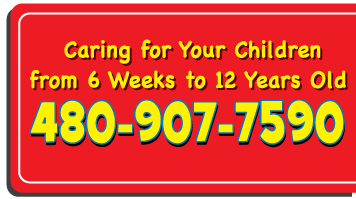 Please bring the completed sheet upon enrolling your infant in day care Gilbert AZ or Queen Creek. Click here to download the infant feeding schedule form. For school aged children that we will be transporting to and from school, a transportation form must be completed. For your convenience, you may print the form and fill it out at home. Please bring the completed sheet upon enrolling your school aged child who will require transportation to and/or from school. Click here to download the transportation form. Click here to download the automatic payment authorization form. Click here to download our testimonial form.